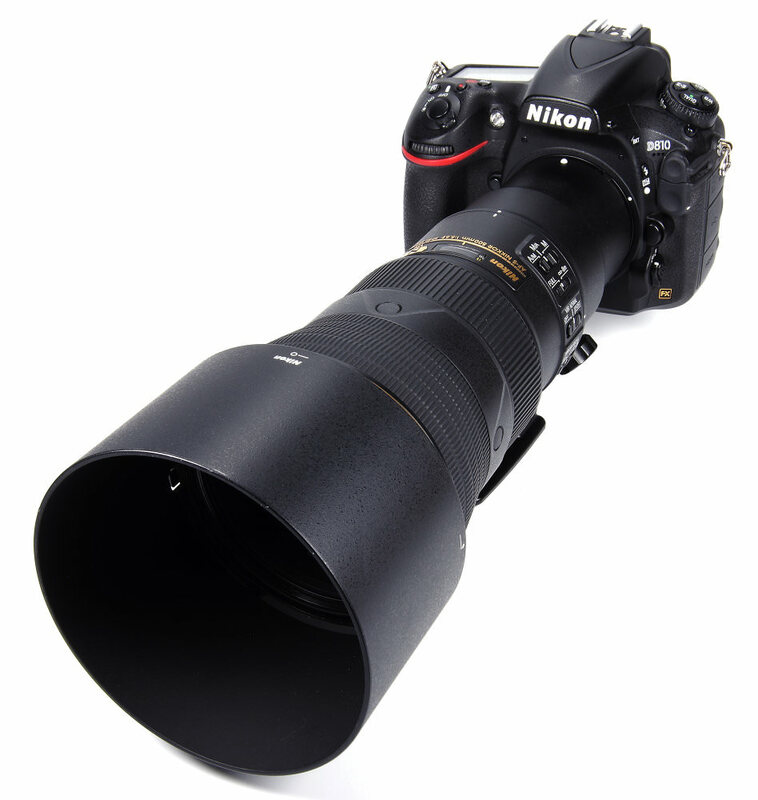 John Riley reviews Nikon's new AF-S Nikkor 500mm f/5.6E PF ED VR telephoto lens for full-frame DSLRs. 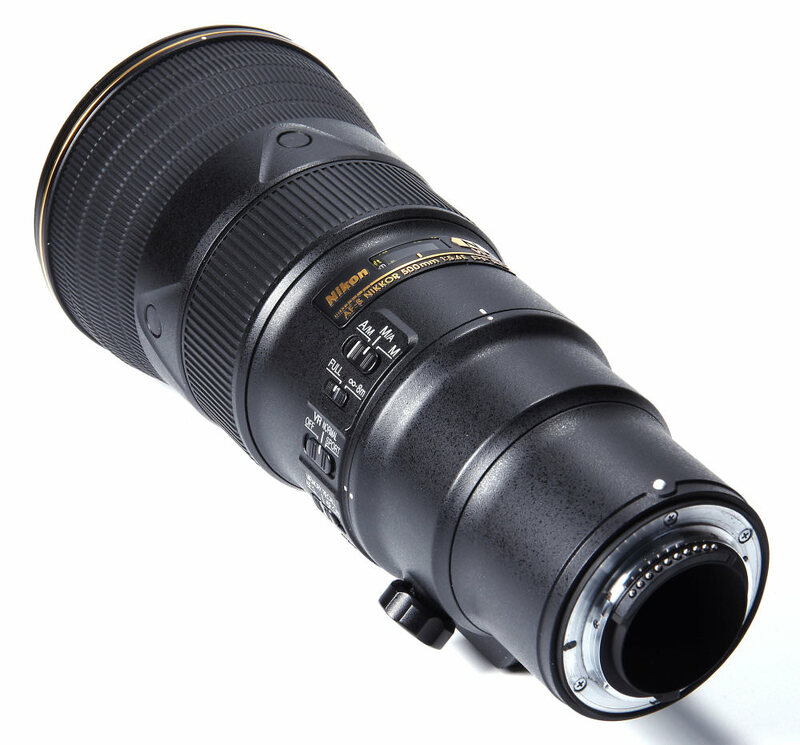 A 500mm lens is never going to be a truly compact lens, but the new Nikkor 500mm f/5.6E PF ED VR is certainly, relatively speaking, as compact as it could get. It is also quite light for such a lens, so much so that the initial impression when first picking it up is a very favourable one. This is achieved in large part by the use of lighter, more conventional glass, with the addition of the Phase Fresnel element that offers a new way to control the CA (Chromatic Aberration) that has always been the bane of long telephoto optics. An intriguing solution, so let's see how the end result holds up and if the performance matches up to the theory. Weighing in at 1460g without hood or caps, or 1550g with hood, the lens immediately impresses with its lightness and fairly compact size. This matches very well with the Nikon D810 36MP body used for this review. The lightness is a real aid to handling and the lens could be used for many hours, hand held, without undue fatigue. The hood is generously sized and fits via a bayonet mount to the front of the lens. There is a locking catch for added security. Within the bayonet, a standard 95mm diameter filter thread is provided. As we move along the lens barrel towards the camera body, first up are four equally spaced buttons that all behave identically to engage whatever focus function is selected with the Focus Function Selector switch, more of which later. Behind this is the wide manual focus ring. Focusing is down to 3 metres, or 9.8 feet. The focusing can be set in various ways, but again more of this later. AF is provided via a Silent Wave Motor and this largely locks on with fast, silent precision. However, in lower light there can be a degree of hunting, especially when using Live View. Distances are indicated on a compact scale behind a clear plastic window. There is no depth of field scale. Behind this we find a variety of switches. The focus mode selector offers A/M (AF priority – manual focus can be used at any time but the focus ring has to be substantially moved for this to happen), M/A (Manual priority – AF can be instantly overridden by MF) or MF (Manual Focus only). The Focus Limit switch offers the choice of Full or of limiting the focusing to a longer range of 8m to infinity. The limiter will help to speed up AF for longer range subjects. The Vibration Reduction switch offers three settings – Off (used when fixed to a tripod), Normal (Still subjects and general use) and Sport (Moving subjects and panning). The Focus Function switch defines the function of the four switches at the front of the lens. AF-L is focus lock, Memory Recall recalls the focus position set using the memory recall button and AF-ON starts AF operation. There is a rotating tripod collar with tripod mount, and as usual this rotating collar is very useful when moving between landscape and portrait orientations. Finally, the Memory Recall button can be used to store a given focus distance, and then recalled instantly using any of the four buttons at the front of the lens. An example of use might be to select a particular branch that a bird tends to return to, enabling the instant selection of the appropriate focus distance as and when needed. The distance is kept in memory even when the camera is switched off or the lens removed. This is an E lens, indicating an electromagnetic diaphragm. This ensures swift and accurate aperture openings even under high frame rates. The diaphragm blades are rounded to help improve bokeh. VR (Vibration Reduction) is claimed to give four stops advantage, a very useful feature in a long lens in particular. However, it is worth bearing in mind that VR will be of no help to reduce subject movement, so, for example, birds and other wildlife will still need fast shutter speeds to arrest movement. Optical construction is 19 elements in 11 groups, including 3 ED (Extra Low Dispersion), 1 PF (Phase Fresnel), elements with nano-crystal coatings and a Fluorine coating on the front element to repel water, dirt and grease. The PF element is something new, this being only the second Nikon lens to use it, and is credited with enabling the manufacture of a more compact, lighter lens. In terms of handling, this is fantastic. The downside indicated is that whilst CA can be well controlled, there can be coloured ring flare as a consequence. This can be minimised using PF Flare Control software, which is fair enough, although it does strike me that ten years or more from now, whoever buys such a lens second hand may find it more difficult to be aware of or find the software solution. With the cost of the lens in mind, the question of how it behaves without the correction has at least to be looked at. The answer is that during the review period no ring type flare was noted. 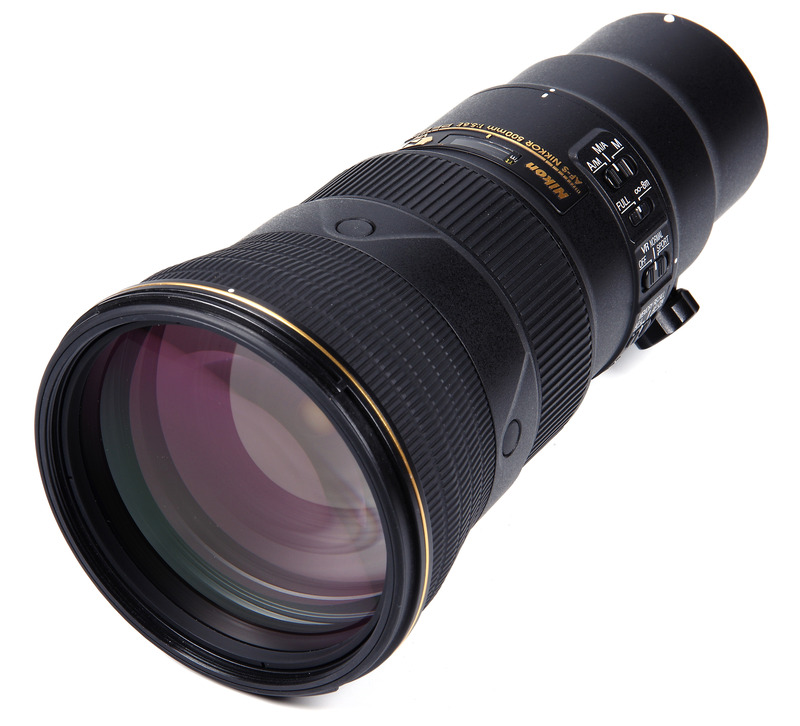 The lens is compatible with Nikon's teleconverters TC-14E III, TC-20E III and TC-17E II. It is hard to fault the lens in terms of its handling. Restricting the aperture to f/5.6 and the unique optical design both help to ensure a more compact, lighter lens. Hunting in lower light is a bit of an issue, as is a tendency to suffer loss of contrast against the light, but in good light and with normal subjects it is just so easy to use that it is a pleasure. There is a partial error in the review in that VR should not always be switched off on a tripod, contrary to the advice in the review. Nikon's tripod mode VR advice for several recent lenses with tripod mode VR ability has been updated to take account of improvements in VR technology. 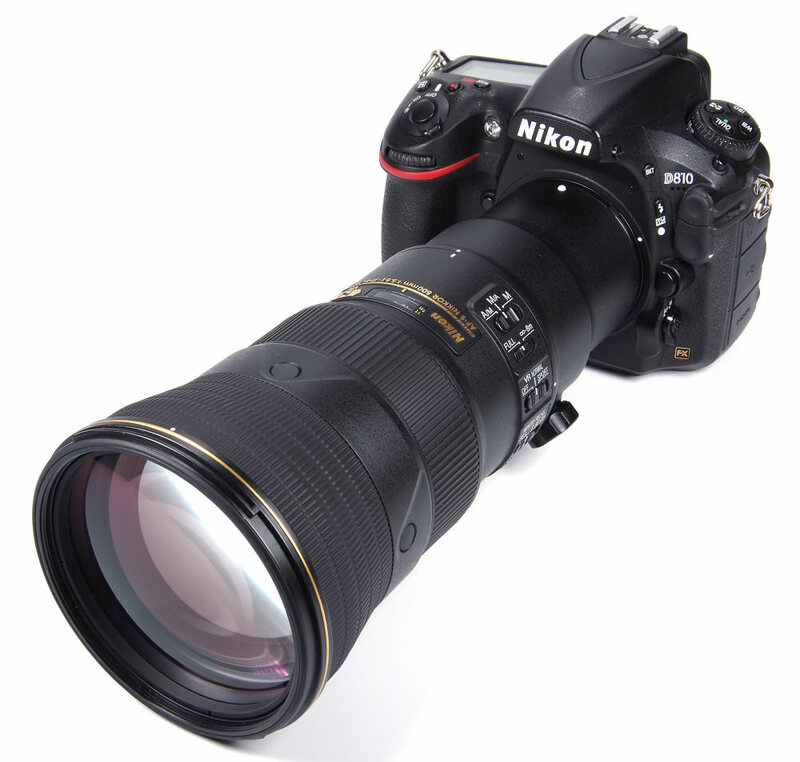 The instructions that come with this lens, and that are on Nikon websites, say "[b]NORMAL[/b] and [b]SPORT[/b] vibration reduction can reduce blur when the camera is mounted on a tripod. [b] OFF[/b] may however produce better results in some cases depending on the the type of tripod and shooting conditions." Put another way, with a very stable tripod used in optimum conditions with spike tripod feet if on grass, best results are likely with VR off. If the tripod selected is not very stable relative to the camera shake effect at 500mm or there are strong side winds, best results are likely with VR on. When using a tripod there is often time to take more than one shot. My advice is each photographer should do there own pre critical shoot testing to determine when VR [b]ON[/b] and when [b]OFF[/b] produces the best results in their typical shooting situations. There is a partial error in the review in that VR should not always be switched off on a tripod, contrary to the advice in the review. Nikon's tripod mode VR advice for several recent lenses with tripod mode VR ability has been updated to take account of improvements in VR technology. "NORMAL and SPORT vibration reduction can reduce blur when the camera is mounted on a tripod. OFF may however produce better results in some cases depending on the the type of tripod and shooting conditions." Put another way, with a very stable tripod used in optimum conditions with spike tripod feet if on grass, best results are likely with VR off. If the tripod selected is not very stable relative to the camera shake effect at 500mm or there are strong side winds, best results are likely with VR on. When using a tripod there is often time to take more than one shot. My advice is each photographer should do there own pre critical shoot testing to determine when VR ON and when OFF produces the best results in their typical shooting situations. I agree Len that sometimes VR on can produce better results on a tripod than VR off, although I assumed, perhaps incorrectly, that when I mentioned a tripod it would be a rock solid one. In those circumstances, VR off would be the best option. However, in the case of rapid moving subjects then a high shutter speed will be needed anyway, to arrest subject movement. I also have always had the feeling that whatever tiny delay locking on VR requires might mean missing the peak of action in some shots, so in those circumstances VR off would be my personal choice. I also agree with you where you suggest individual photographers should experiment and find out what gives the best results for them. Thanks for adding the comments. More images to follow soon - the review period has been plagued with atrocious, wet, windy weather. I agree Len that sometimes VR on can produce better results on a tripod than VR off, although I assumed, perhaps incorrectly, that when I mentioned a tripod it would be a rock solid one. In those circumstances, VR off would be the best option. However, in the case of rapid moving subjects then a high shutter speed will be needed anyway, to arrest subject movement. I also have always had the feeling that whatever tiny delay locking on VR requires might mean missing the peak of action in some shots, so in those circumstances VR off would be my personal choice. I also agree with you where you suggest individual photographers should experiment and find out what gives the best results for them. Thanks for adding the comments. More images to follow soon - the review period has been plagued with atrocious, wet, windy weather. Thanks for the review John. This is a cracking lens and very useable in the field owning to its light weight. I find the four AF-on buttons are a great help in the handling. Not yet tried them as focus recall but I'm sure the day will come soon!. [quote]I However, in the case of rapid moving subjects then a high shutter speed will be needed anyway, to arrest subject movement. I also have always had the feeling that whatever tiny delay locking on VR requires might mean missing the peak of action in some shots, so in those circumstances VR off would be my personal choice. [/quote] Living where I do in the Yorkshire Dales many of the best views are across narrow steep sided valleys. A consequence is about 75% of my landscape work is at 400mm and longer. I suggest you perhaps check out your view on "VR delay" against the lates VR (and IS) designs. It was over half a second with the original 80-400. On lenses like this one and the 200-500 zoom the delay is reduced to near instantaneous. VR running before the peak of action eliminates the delay factor with typically older than 6 year old lens designed. In addition VR even at shutter speeds faster than 1/500 helps AF better keep on the intended target. This can help a lot with birds in flight. I was interested in your comment on occasional flare issues. It was an issue Nikon acknowledged from day one with the 300 PF. I only found it an issue with the sun very close to the subject. Nikon say of the 500 PF in the specification "by adopting newly developed lens materials flare effect due to the characteristics of the PF lens is optimally controlled. As a result, light sources can be reproduced in near original colours." So far despite deliberately trying I have not been able to produce lens flare. This is not quite the same as saying it is never present. However, in the case of rapid moving subjects then a high shutter speed will be needed anyway, to arrest subject movement. I also have always had the feeling that whatever tiny delay locking on VR requires might mean missing the peak of action in some shots, so in those circumstances VR off would be my personal choice. Living where I do in the Yorkshire Dales many of the best views are across narrow steep sided valleys. A consequence is about 75% of my landscape work is at 400mm and longer. I suggest you perhaps check out your view on "VR delay" against the lates VR (and IS) designs. It was over half a second with the original 80-400. On lenses like this one and the 200-500 zoom the delay is reduced to near instantaneous. VR running before the peak of action eliminates the delay factor with typically older than 6 year old lens designed. In addition VR even at shutter speeds faster than 1/500 helps AF better keep on the intended target. This can help a lot with birds in flight. I was interested in your comment on occasional flare issues. It was an issue Nikon acknowledged from day one with the 300 PF. I only found it an issue with the sun very close to the subject. Nikon say of the 500 PF in the specification "by adopting newly developed lens materials flare effect due to the characteristics of the PF lens is optimally controlled. As a result, light sources can be reproduced in near original colours." So far despite deliberately trying I have not been able to produce lens flare. This is not quite the same as saying it is never present.